When Team Canada’s plane departs for its training camp prior to the 2019 World Under-18 Junior Championships there will be two Steelheads onboard; Thomas Harley and Keean Washkurak. 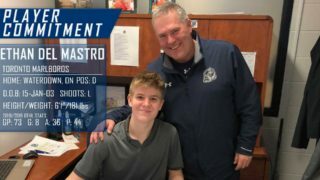 Harley, a highly-touted 2019 NHL Draft Eligible prospect is coming off an impressive sophomore season in the OHL with the Steelheads. Harley recorded 58 points in 68 regular season games with the Trout, good for eighth most by a defenceman in 2018-19. He followed that up with a solid display in the playoffs recording four assists in four games against the Sudbury Wolves. His play has attracted the praise of multiple scouting sources this past season. 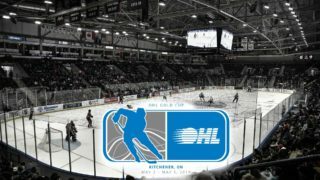 NHL Central Scouting put Harley ninth amongst North American Skaters in their Midterm rankings, that spot was the highest awarded to an OHL prospect, TSN’s Craig Button listed Harley 16th in his most recent rankings and Sam Cosentino of Sportsnet put Harley in the top 10 of a list of combined North American and European prospects. Consentino’s analysis of Harley’s game may have been unconventional stating, “It’s better to rein in a wild pony than to try to create one.” But it’s actual meaning bodes well for the big defenceman who’s free-wheeling and smooth skating style will translate well to the large ice surfaces he will encounter in Kisakallio, Finland for training camp and potentially Ornskoldsvik and Umea, Sweden for the main tournament. Harley isn’t new to wearing a Team Canada jersey, having suited up with Team Canada Black at the 2017 Under-17 World Hockey Challenge. 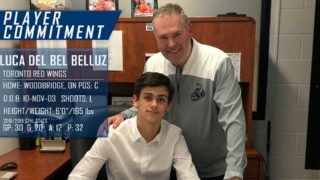 Keean Washkurak will get a chance to show his stuff to the U-18 coaching staff after a stellar sophomore season with the Trout. 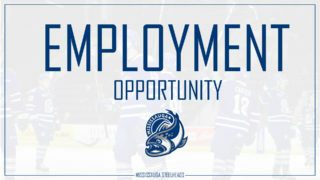 The Waterloo, ON native recorded 47 points in 66 games for the Steelheads in the 2018-19 season. Washkurak made noise on NHL Draft Boards this year with his play and earned spot #134 on the NHL Central Scouting’s Midterm Rankings. This won’t be the first time in the Red and White for Washkurak either, the centreman was a member of Team Canada Red at the 2017 World Under-17 Hockey Challenge. 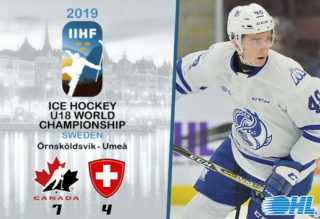 The Canadians this year have been drawn into a group with the Czech Republic, Belarus, Switzerland and last year’s Champions Finland for the main tournament which goes April 18th to 28th. CLICK HERE for the official tournament schedule! Other OHLers joining Harley and Washkurak on this year’s Team Canada’s roster include; Ryan Suzuki (BAR), Michael Vukojevic (KIT), Jamie Drysdale (ER) and Jamieson Rees (SAR). 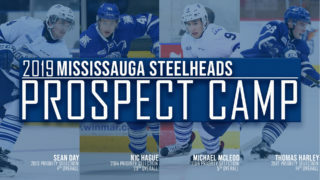 The last Steelheads to represent Canada at the tournament were Nicolas Hague (2 A in 7 GP) and Michael McLeod (2G, 2A in 7GP) at the 2015-16 edition of the tournament. Harley will hope to follow in the footsteps of Hague, who went on to win CHL Defenceman of the Year following his selection by the Vegas Golden Knights in the 2017 NHL Entry Draft. Former Steelheads forward Alex Nylander also represented Sweden at the 2015-16 tournament scoring 11 points (3G, 8A) in seven games.